Nothing's wrong with this dress (that's why I just bought it on eBay). What's wrong (and I interrupt this blog post to bring you news of a bevy of flying pigs outside my window and the Pope's sudden conversion to Baha'i) is that all of a sudden, I am dissatisfied with full skirts. I hope it was just something I ate. Food poisoning or no, I have been trolling eBay for narrower-skirted dresses … and this one was a Buy It Now that isn't a Regret It Later. I swear. Look how cute the pleated-front version is! I'll probably shorten the skirt to hit at the knee (and I might make the plain front version in not-lace) but … look how cute! I'm not sure what I'm going to do about the full-skirt-wrongness problem. Sleep on it, I guess, and flip through the major-metro-area phone book that is September Vogue. I know, I know, what's with the hip pockets again? The blue dress looks like the one that Doris Day wears in Midnight Lace, one of my favorites of her films. Rex Harrison does such a wonderful job as the sinister husband, as well. 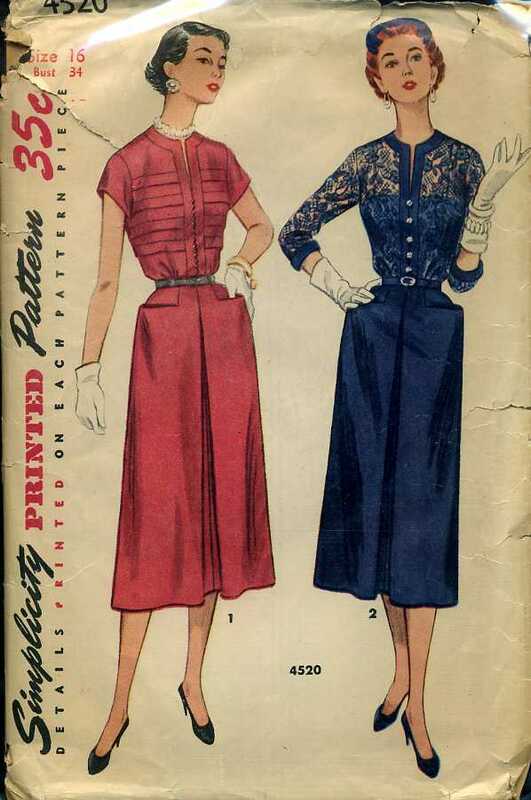 Nice dress — but those pockets look like they might do unpleasant things to one’s hips. (I’d love to see the finished version of this dress when you’re done).About the skirt thing? You just crave a change — that’s the essence of fashion after all. Oh, I just adore the blue one…that lace overlay is so Grace Kelly! Also…love the site. I check every day!